We made multiple trips into Seville while we were in Spain, especially since our hotel was only 35 minutes away. I hadn’t been to Seville since I was in high school and had a very vague, distant memory of it- of winding streets, the sound of the Spanish guitar and some notable sights like the Alcázar of Seville. I couldn’t wait to go back and have Thomas explore the city for the first time. Now that I’m practically twice my age as I was back then, there is so much more that I appreciate and notice. After spending the first half of the day at our hotel, we went into the city for the afternoon. If there is one thing I remember about Seville, it’s how hot it was when I was there! And after talking to my sister, who lived there for over a year, we packed for the heat. I brought this polka dot crop top & midi skirt that felt a bit more like a swimsuit top and coverup than anything else, but very ideal for those hot hot summer days. I’ve always loved a matching combo and also love this pink version or this lavender one that’s on sale. A few restaurants and shops lingered open as we eased into the later afternoon, with most closing for a siesta. We walked around, stopping when something caught our eye, which mostly happened to be all of the beautiful, colorful Spanish tiles. Many of the doorways, floors and courtyards of the homes have at least a small amount, if not an entire wall, of them. We found ourselves popping into shops to even look at some of the ceramic tiles that they were selling, but since we’ve already finished all of the tile work in house, we didn’t have any excuse to get any unfortunately. We had plans of visiting the Alcázar and Plaza de España, but since both are such large tourist attractions, we wanted to go early in the morning on different days. Thomas had found Casa de Pilatos, a beautiful palace in the historic Santa Cruz neighborhood, that seemed to be much quieter and less crowded, to check out on this afternoon. Built in the 15th century, this Andalusian palace is a Gothic Mudejar style, with intricate tile work and an exquisite courtyard in the middle. I couldn’t get enough of all the details- inspiration overload! From the mix of colors to the geometric shapes and intricate carvings, there is something to be noticed in just about every corner. Thomas and I couldn’t stop talking about how much thought and beauty went into and still is there, in almost every single building in Seville. We could have spent a whole week in the city alone. Everything is so beautiful and you are rocking this matching set! Great post! 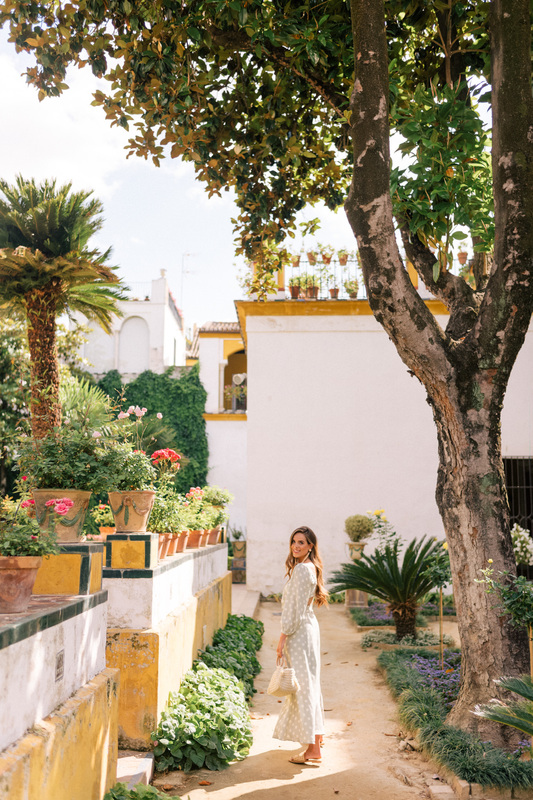 These photos are gorgeous, and I can only imagine how beautiful Seville is. 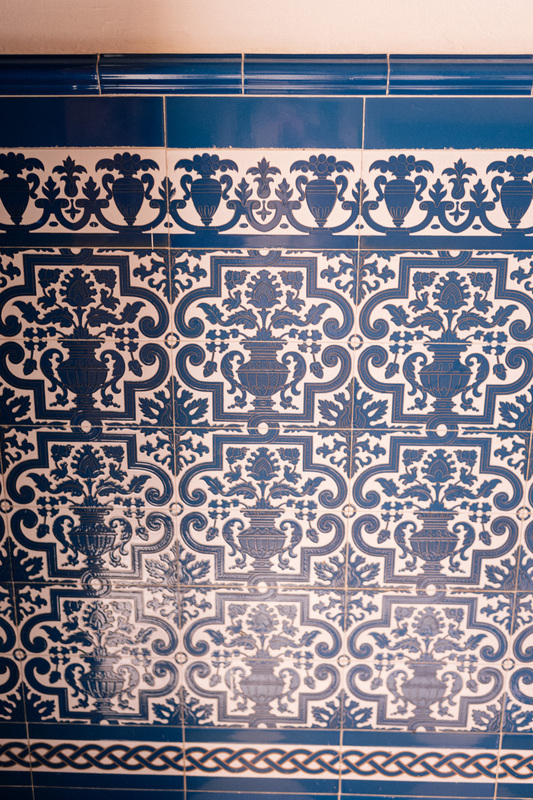 It’s a dream of mine to visit Spain, and I love the culture and tile work there. Gorgeous! You guys should visit India, m sure ul love it ! So many beautiful, intricate designs! I love your outfit Julia you look wonderful! Absolutely lovely!! I would love to cover my apartment in these tiles. This polka dot set looks perfect for the hot Seville weather! Looks gorgeous on you! This set is everything!!!! You are rocking it! This was one of the places I wanted to go to so badly when I lived abroad and didn’t get to. It is GORG! You look lovely in that matching set, Julia! It is gorgeous there! I definitely want to go to Seville and this polka dot set is so cute! I love your outfit in this! And Seville looks breathtaking, those tiles are so intricate! Just another place I’ll be adding to the bucket list. Such a cute set. I love Spain, and these photos are so beautiful. My husband lived there for a few years and we went North to South for a few weeks. He is completely fluent in Spanish (to the point that he translates for surgeons when he goes away for a week to volunteer in Spanish speaking countries) and Seville wasn’t m husband’s favourite but I wouldn’t know why with how pretty this spot is! It sounded like such a great trip and these photos and tiles are amazing! I can see why you had inspiration overload. Matching separates are one of my favourite things to wear on vacation! They’re so easy to wear together or apart for a put together look. It looks like such a beautiful city. I love all the bright colors. Looks like a wonderful place to visit!! Would love to pick up a few tiles for decoration around the house. Such a nice way to remember it by. Love your ensemble so much, especially those trousers! <3 :) The flared silhouette makes it so easy to dress up for a super elegant look! Where are your fish earrings from? I love them!